The town of Kennecott is one of the most interesting places to visit. We woke up in the brothel this morning and meandered across the street for breakfast before heading up to the mill town to shoot more photos. Jaz was in heaven on account of all the rusting industrial parts laying all over the place. She loves to photograph rust. Kennecott is her town! The old mill produced a ton of copper before it shut down for good in the 1930s. Today, it is a National Historic Landmark and one of the coolest places to visit. Off the beaten path, there are no large crowds here like Denali, and the coffee with a view at the Glacier Lodge is not that bad. 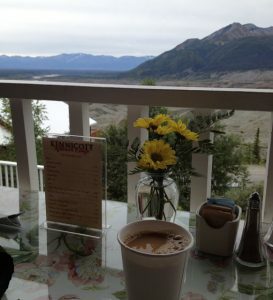 Sipping coffee from the deck at the Kennicott Glacier Lodge. We kept running into a couple of Pennsylvanians on this trip. They stood out on account that they were in search of cigarettes at the end of the road last night and came up short handed. They needed to back track eight miles to get a pack (not as far as our gas fiasco yesterday), and they sweet talked the shuttle driver into waiting for them in McCarthy. We played leap frog with these two gentlemen several times throughout the day. They were planning on seeing all of Alaska by car and were headed to Valdez via Anchorage, Denali, Fairbanks and McCarthy. They had a trusty little red rental car they were racking up the miles on. 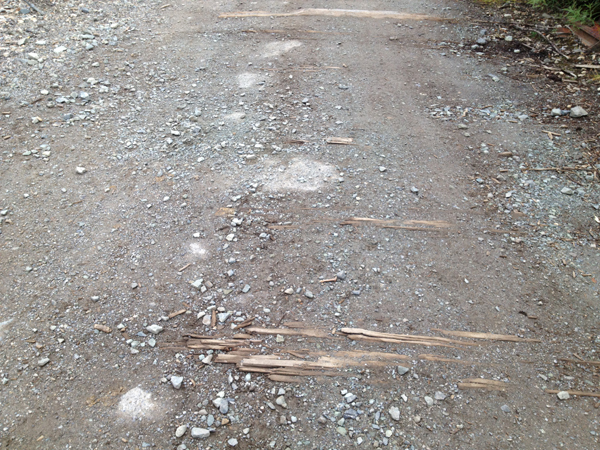 It rained today on a muddy road. It was pleasant. I like the mud. At some point Jaz and I got separated. I just enjoyed the mud and the rain, and played the “Miss the railroad ties with your front tire game.” GUESS WHAT – no flat tires. I finally caught up with Jaz and we made it off the dirt road into Chitina for lunch. Victoria, a local, had us laughing at all her jokes and soon we were on the road again. We stopped at Liberty Falls and tragedy of the Amish kind struck Jaz. What is the tragedy of the Amish you ask? Let me tell you little grasshopper. The Amish strike when modern equipment stops working (for whatever reason). Earlier, Jaz’s phone stopped working and at first we thought the one brothel plug didn’t work properly, but then we realized the phone just wasn’t holding a charge. The second act of Amish occurred when her camera stopped working. Of course, dropping it in Liberty Falls could also explain the reason why her $1,700 camera stopped working, too. I glanced over just in time to see her slip on one rock and fall forward over another rock that was about the size of a chair. 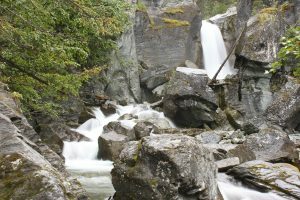 She hit the rock hard with her chest and her camera flew away from her body (still attached to her neck) and landed in the fresh mountain spring water. She grabbed after her camera, but it was too late, the entire thing (camera, lens and all) got submerged. *Sigh. * This is going to be an expensive trip for her. The camera was on at the time, so the sudden water/battery combo is not good. It’s completely dead. The lens has water in it. We headed just a little ways down the road to the Copper Moose B&B. What a wonderful place to dry out and clean up the gear. We plan on leaving here very early so I can make a half day of work in Anchorage tomorrow. Liberty Falls claimed Jaz’s camera. Below is an image from the GoPro of Jaz crossing two bridges at the end of the dirt road to McCarthy. Most people give up their cars for a shuttle for the last four miles to Kennecott. We crossed the foot bridge. Check it out here: even though the day was challenging and Jaz faces a trip to Stewart’s Photo Shop (she will live to shoot another day) in the morn, a rainy day on the bike is better than a full day in the office. She was able to save her camera chip and the photos are okay. Oh, good. Glad to hear it. 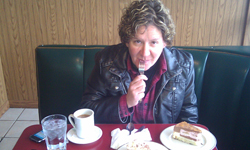 I meant to say also, this is the best opening line ever for a blog post: "We woke up in the brothel this morning and meandered across the street for breakfast …"
I enjoyed reading and watching the video. You capture travel well. It was nice meeting you guys as well, are u still in Alaska? Great! Will do. One never knows where you might rider your motorcycle to! Take Care and I will add you email to my little book.